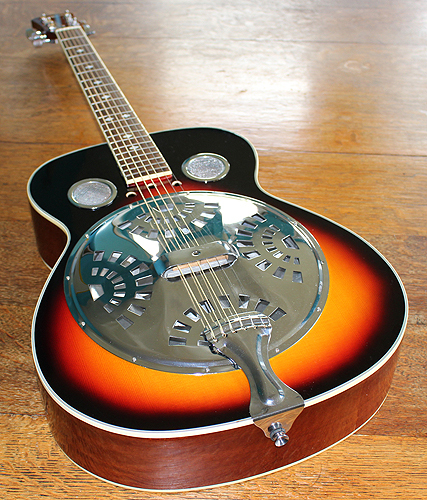 Martin Smith guitars are a U.K based guitar company who work with music teachers to create guitars for beginners, students and home players who want an instrument to play, but don't want to pay Martin or National prices for their resonator instrument. What is the construction of the guitar? 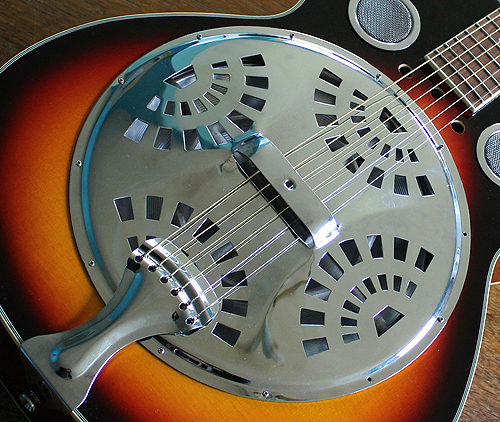 The Guitar has a single metal cone and chrome resonator plate. I cant identify the woods or the country of origin but in all probability its from the far East. That is not a criticism of the guitar as many guitars that 20 or 30 years ago which were considered beginners instruments are now highly sought after. 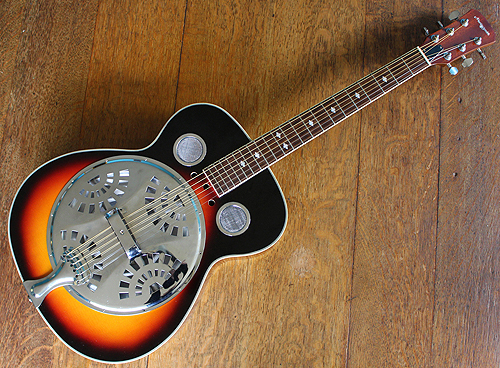 The early Yamaha FG range of Japanese guitars are a relevant example here. 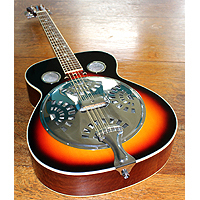 This is quite a heavy guitar due to the metal work but the sound is solid and it does not suffer from fret problems or buzzes which is one of the characteristics of resonator guitars. 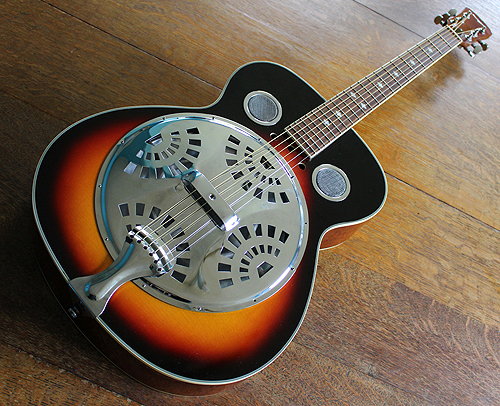 resonators are often played exclusively with a slide and are often played face up sitting on your lap. What type of neck is used? 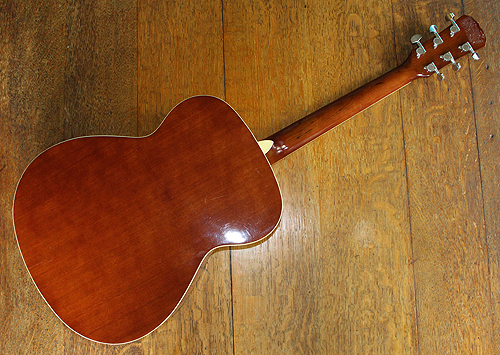 The neck is round like a regular acoustic guitar as opposed to a square neck version. 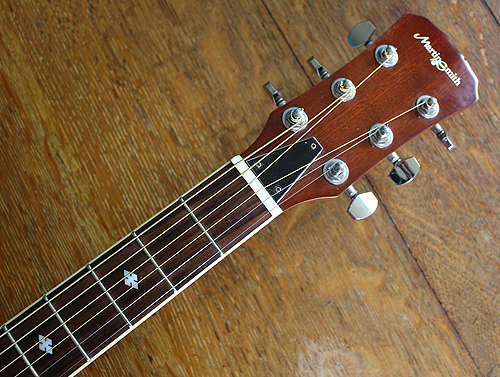 This gives the player the advantage of playing the Martin smith guitar in a regular position. The guitar features some nice shaped position markers that add to the overall look of the instrument. The finish looks good and there are very few scratches over the entire guitar. The colour and shape is traditional and you can see examples of this type from the 1930s onwards. The sound quality is very good with plenty of projection with the heavy strings. The guitar has been recently set up with a set of Martin 12 - 54 strings, but I have used lighter strings on it when using it with a finger picking style and it still has a strong sound. The set up on it will allow for this, although really they are are designed for slide playing. The condition of the guitar is very good and it will be packed in a soft guitar case and boxed for protection during transport. please email me with any questions and see the photos above.